On the afternoon of July 7, 1931, a B.M.T. Putnam Avenue trolley jumped its tracks at the corner of Nostrand and Putnam Avenues and rolled into the Weiner drugstore at 401 Nostrand Ave. There were six injuries. 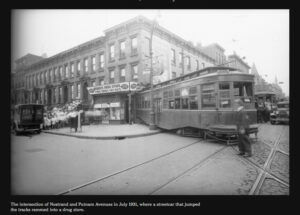 Trolley accidents were frequent: this was the 5th in Brooklyn that week. There were so many trolleys in Brooklyn that residents were derisively called “trolley dodgers”, which is where the name of the former Brooklyn major league baseball team (uprooted by the infamous Walter O’Malley, lower left) came from. The Dodgers name first appeared on team uniforms the next year, 1932. On the day of the derailment, they beat the Phillies, 5-1. Note the many straw hats in the upper photo (from the July 8, 1931, Brooklyn Eagle): it was summertime. The 2015 releases of Old & Rare brandies will appear in the November catalogue; we will email about them on October 1. HOWEVER, anyone with $600 and a taste for one of the best and most unique brandies on the planet should call us (1-800-782-8145) and reserve a bottle of the Barrel V154 Chenin Blanc, from 1985. Finally, Pear de Pear, 2nd release, scheduled for a year ago. Joe Corley took 18 months to perform craft-method magic on pear distillate that was a touch underflavored (a grower may have overwatered his orchard); it includes a maceration of buttery Boscs. Even richer than the original. A bargain. Single-barrel V320 is a gorgeous and highly aromatic Riesling distilled from lees wine in 1998. The focused intensity is astonishing, yet the brandy is ever so soft. Now that we have old ones, we are wishing we had, way back, distilled more brandies from aromatic grapes: Riesling, Muscat, Chenin Blanc, Semillon, Viognier. We are buying more of these grapes now, but it will be 15 years before we can use them in say the XO. Low Gap 4-year wheat whiskey includes some of Crispin’s earliest distillations (2010) and has been through sophisticated barrel work. Unbelievably soft. A Bourbon will arrive in December. Last month, I saw a store mailer for a 1.75L bottle (the size Popov comes in for supermarkets) of Hangar One: $27. The 750ML – less than 1/2 the size – used to go for $35-38: very high-quality stuff is expensive to make. The Vodka DSP CA 162 is superior to the original H1 bottlings; I recommend the subtle & complex Citrus Medica (Buddha’s Hand citron), which can be sipped at room temperature, like good brandy. I have been shooting short video segments about our spirits and how we make them, many appear next to the listings on the C&W website. They are collected at http://www.craftdistillers.com/journal/. Lots of tech production info; many more are on the way.